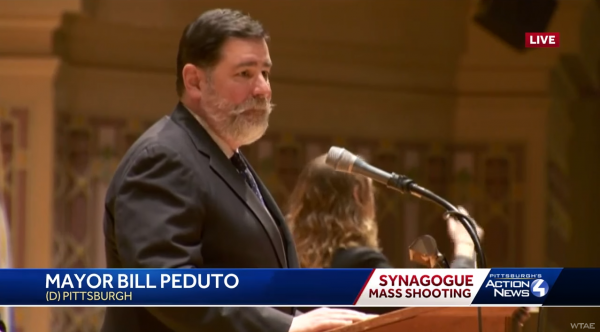 Almost literally before the ink dried on legislation that bans so-called “large capacity” ammunition magazines and possession of so-called “assault rifles” from the City of Pittsburgh by Mayor Bill Peduto, local residents with support from the National Rifle Association filed a lawsuit challenging the bans in the Allegheny Court of Common Pleas. The case is known as Anderson v. City of Pittsburgh. The bans were in reaction to last year’s attack on the Tree of Life Synagogue, where 11 people were killed and seven others were injured. The attack occurred last Oct. 27, and the suspect, Robert G. Bowers, has been charged with dozens of crimes, both state and federal. It is the latest development in what seems like a long-running battle over gun rights versus gun control in the United States. High-profile mass shootings, while rare, stir emotions and invariably result in pushes for more gun control. Currently in California, there is a stay in a federal case challenging that state’s ban on “large capacity” magazines after U.S. District Judge Roger Benitez in San Diego declared the ban unconstitutional. The state will appeal to the Ninth Circuit Court of Appeals in San Francisco. Under the new regulations, magazine capacity is limited to ten rounds, even though handguns used commonly by private citizens and police typically carry more ammunition, depending upon the caliber. Critics of such local ordinances, and even statewide laws that recognize so-called “gun free zones,” contend that none of those restrictions has ever prevented a mass shooting. Indeed, most mass shootings occur in “gun free zones” such as schools or businesses that post their premises off-limits to even licensed concealed carry. The argument is that these laws only disarm law-abiding citizens, making them defenseless victims against armed madmen or terrorists. Of the 11 people killed in the October attack, the youngest was 54 and the oldest was 97. Many people considered it an act of domestic terrorism. A third measure is aimed at temporarily disarming people who are considered “extreme risk” threats to themselves or others. Such laws are generically dubbed “red flag” or “Extreme Risk Protection Orders” (ERPO) and they have been at the center of a heating controversy. Recently, the Second Amendment Foundation issued a stern warning that such measures must provide for due process. If you haven’t checked out and liked our Facebook page, please go here and do so. You can also follow us on Twitter at @co_firing_line and be sure to check out our MeWe page here and our new PatrioticSpace group here. Previous articleWhy is our military involved in Yemen?